Helicopter Force Trim building ..
Thread: Helicopter Force Trim building .. I am building a fully funcional KA-50 Cockpit for the forthcoming Digital Combat simulator' KA-50. I am building the Stick from a modded old Thrustmaster grip and the Collective and rudder from bottom.. BUT.. I want the mechanical part of the helicopters Force-trim to be functional with my Opencockpits cards. So when I hit the Trim center button, the stick and pedals mechanical centerpoints are reset to the current one..! My only problem so far is HOW..? I have thought of using a solenoid to open some kind of "brakepads" on the axis and allow it to return to its spring loaded centerpoint. And then "closing" the brakedpads again. Leaving the cyclic and rudder in it's current position? I have also toyed with the idea of building a helicopter pit for Black Shark. The videos look awesome,, especially the start sequence where the sim pilot uses Trackir and touch screens to go through the realistic start ! A couple of years ago I built a collective for use with the helicopters in Fs2004 and it works great. I've been looking forward to trying it out with Black Shark for quite some time now. hope its released soon. As for the force trim,, I have a friend that also cruises this forum and he has come up with a idea of using a small electric clutch ( I'm not sure which website he found them on but I'll ask ) to simulate the elevator force on a fixed wing aircraft. The clutch would be interfaced with an IO card that would allow the clutch to get input from the airspeed value. The higher the airspeed the more the clutch would squeeze the elevator axel. This should give a fairly accurate representation of how the yoke feels sloppy at slow speeds and more firm at higher speeds. Maybe something like the above could be used for force trim?? I remember a previous thread where force feedback was discussed at length ,, with some amazing ideas from quite a few of the guys. 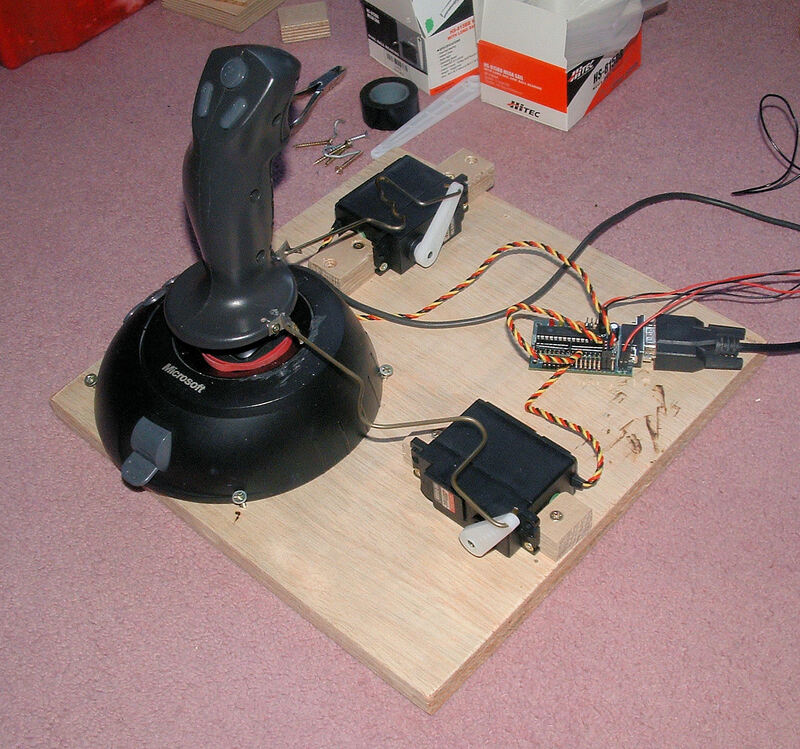 I am not sure if it would work for you, however, what about using the base from an old Force feedback Joystick? Could that not be implemented somehow? The Force feedback could be enabled or disabled through the OC Interface. I tried building an extended stick using an old Logitech Wingman FFB stick. With anything heavier than the small light plastic (original ) grip,, the FFB motors are just too small to get any kind of feedback. Perhaps someone with more electical knowledge than me could hook up bigger motors and use the original sticks circuit board. That would work . With bigger motors,, I'm sure resistors and proper cooling would then be an issue. Also an issue would be Fs9 (and I'm sure FsX) has such poor FFb files,, compared to ,,say,, IL-2Fb. Black Shark probably would have good force feedback although I haven't heard either way. When flying helicopters in Fs9 I use a Microsoft Sidewinder with FFB but I use a small app called "RTC"that was originally made for race car sims that don't have FFB coded in the sim. It gives an FFb stick (or wheel) a good center spring feel and a steady thumping at any freq. that you choose. That feels quite realistic when flying choppers. Much more so than the Microsoft fixed wing FFb files. Yeah, I was using a Microsoft FFB JS and it had larger motors then what I have seen on the logitech equipment. But when you install the leverage of a 20 Pipe on top of it, it may not hold the weight. I believe the force trim system that Triggerhappy is referring to is different from force feedback. I think it's basically a spring centering force with an adjustable center point. From the manual: "The force trim unit, acting as a spring-loaded centering mechanism, provides an artificial feel for the pilot maneuvering when desired". There is a magnetic brake that allows the pilot to release the "fixed" end of the springs, resetting the zero point of the centering force. I don't think it's necessary to incorporate the OpenCockpits card at all. In operation, the magnetic brake is operated by the pilot pushing a button on the cyclic. There's really no reason not to do something similar in the simulator. The challenge here is to find an affordable brake mechanism that has little or no backlash. Something like an electrically operated automotive air conditioning clutch or a small tractor power take off clutch might serve as a starting point. The problem with them is the expense. I'm inclined to think that a DIY magnetic brake is a possibility; however, there's probably a ready made solution somewhere. Thoughts?? I have the same experience with extending the stick of a FFB joystick myself.. It just don't seem to be powerfull enough to really make a difference. And since I am building the stick to resemble the KA-40 stick with the trigger mechanism made out of aluminium. It will have to at least give some feedback with this added weight..? Adding force feeback to a DIY Yoke from Logitech FFB joy..
A totally DIY adding of FFB to a stick.. So far the solution from the simprojects.no site looks promising? Anyone tried this approach to the issue? My apologies mate I appear to have missed this thread but the other boys seem to have covered more than I know, well done chaps! It would appear that I am joining this thread a little late! There is a Demo downoad available. You can really play around and very quickly build your own profiles. I have a twin yoke in a Baron 58 forceback driven by a modified Logitech Wingman Board, two "H" Bridges that can deliver 5 Amps (in an aircooled aluminium case) for X and Y axis FF manipulation. I should have added some pictures that might help! The first picture is the Logitech board with two "H" Bridge devices attached in it's development stage. The second picture is the FF Motor etc driving the Aileron FF. The third picture is the two FF Motors etc driving the Elevator and Aileron Yoke etc.. The third picture is the FF Motor etc driving the Elevator. There are other pictures of the assemblies around if needed! New helicopter cockpit =) Help please..